A spam musubi, careful readers will remember, is a Japanese-Hawaiian treat consisting of a rice ball (omusubi) with a piece of teriyaki spam tied to its back with a strip of nori seaweed. 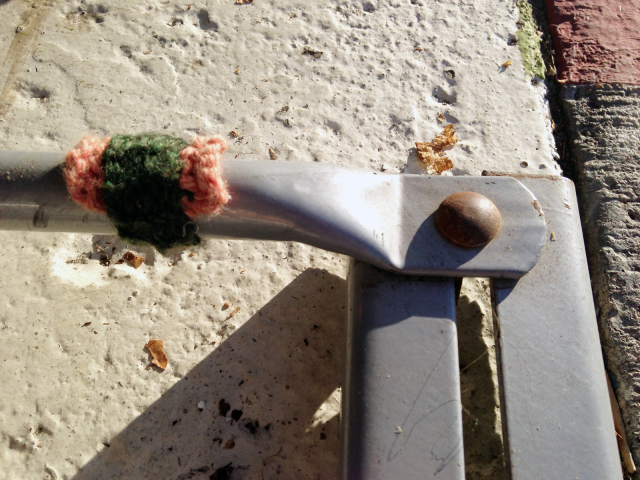 A very small-scale guerrilla knitter appears to have constructed the spam and seaweed part out of yarn and attached it to this bike rack in front of the Box Jelly, the co-working space I’ve been frequenting. Until this caught my eye, I had not seen any signs in Honolulu of the knitting trend that seems to be unstoppable in much of the world, from Japan to the mainland US to Europe. Maybe is just too hot to knit here, or indeed, to wear many of the garments or fibers that people usually knit (turtleneck sweaters, wrist warmers, alpaca, wool). But this knit musubi tells me that there is at least one guerrilla knitting here with a strong sense of local color. Speaking of local color, I’ve been taking mental notes on the color sensibilities here, which are completely different than anything I’ve ever seen, even in other warm places like Southern California. Maybe it’s the strong, tropical light, or the look and colors of the leaves and flowers in the environment, or the general acceptance of a “beachy” and permanent-vacation-esque aesthetic. Somehow, color combinations that I would consider tacky or kitschy elsewhere look just right here. My house, for example, is white with very bright, almost fluorescent swimming-pool-green trim — a look that you see all over town, such as at the new Kaimuki Superette foodie sandwich shop. Considering the knit street art above, and the amazing hand-lettered sign below, which certainly is an aesthetic enrichment to its street in my book, I’d have to say that spam pink is another major shade in the local color palette! Now I’m curious: if you know Hawaii, what colors do you associate with this place? And what colors do you associate with the culture where you are? 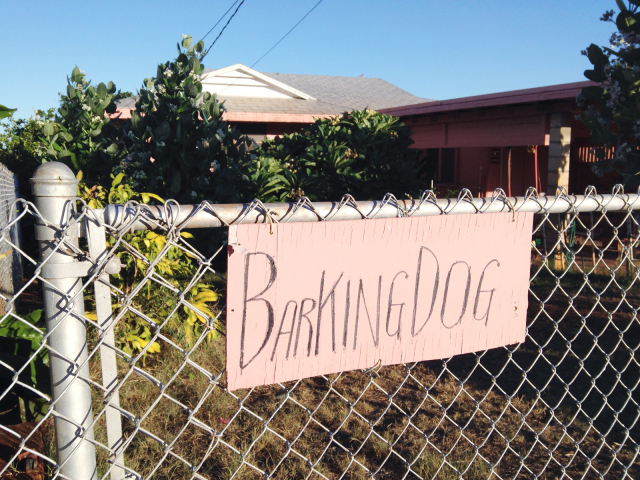 This entry was posted in Blog and tagged honolulu, lettering, local time, signs, street art. Bookmark the permalink.